U.S. Supplier & Manufacturer of Armed Forces Guidons, Flags, Navy Award Pennants, Campaign and Award Streamers, Ceremonial & Organizational Flags, Indoor Flag Sets, Uniform &Parade Equipment & More. U.S. Government Supplier specializing in Military Specified(Mil-Spec) Flags, Guidons, Parade, & Ceremonial Equipment. We ship to FPO/APO/DPO. U.S. Government Purchase Cards Accepted. Veterans Serving with Pride since 2002. 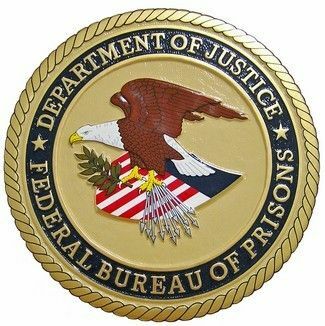 This federal Bureau Of Prisons wall & podium plaque is made of solid kiln dried mahogany wood. Traditional handmade products made the old world way by carving,painting and hand painting. These plaques will greatly enhance your office setting and will also make a perfect retirement or going away gift. This item could also be personalized according to your specifications. We offer deep discounts on quantity buys. Please contact us for a price quote on avy design not listed. We can make almost any custom design. quantity buys.